This new fine art limited edition digital re production print of the original work by John Olsen titled “Anticipation”, it is a limited edition quality fine art print signed by hand and titled by John Olsen, the edition has been limited to 65 only, the sheet size is 59cm x 44cm, The print “Anticipation” is made on high quality Arches archival paper using the best quality technology affordable. John Olsen and a few other Australian iconic artists felt these Australian fine art edition prints are a way for art lovers to be able acquire an affordable piece of there wonderful fine art works as there is only one original painting, works on paper or water colour. John Olsen’s traditional fine art etchings prints silkscreen’s Lithographs have so far made it possible using a traditional medium to let the public enjoy there work, how ever now with the Australian fine art edition quality prints they can enjoy his original fine paintings even more so. Etching House has a lay by payment plan on 20% deposit for Fine art print titled “Anticipation” by John Olsen, please ask for Rolf on Ph 0413 007 054 – 7days 9am to 9pm. Please note all forms of art work has a tendency to not like bright light or sunlight or this applies to coloured furnishings as well, carpets curtains furniture, it is important that before hanging all forms of art works you be certain of the conditions and environment. 120 -130 years before any noticeable fading occurs under these conditions. Anticipation fine art print has run out there are 2 in for resale by clients. Frog and Fly fne art work print is new at Etching house, taking over form Anticipationnow finished it is proving to be popular as well at Etching House. Edition prints by John Olsen at Etching House. 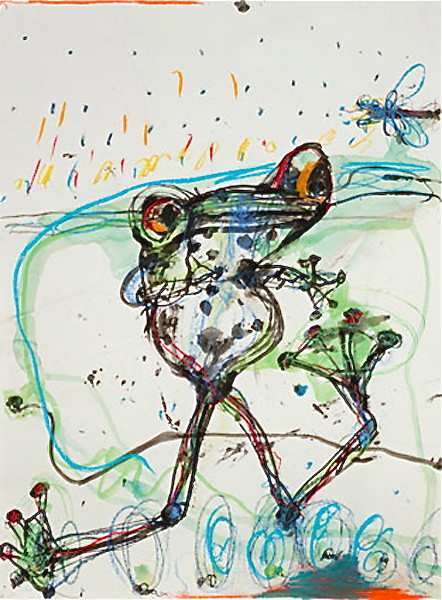 Edition of Frog and Fly reproduction image Print by John Olsen in stock at Etching House. Sydney Sun, Anticipation, Popping Blue Bottles and Frog and Fly edition prints by John Olsen at Etching House. Etching House specialists in Australia for John Olsen limited edition fine art. Etching House Australia for John Olsen etchings, prints and watercolor, Acrylic on paper, works on paper. Below is a complete title list of the John Olsen fine art digital reproduction prints available at Etching House Australia. Etching House specializes in the trading of Australian limited edition fine art digital reproduction prints hand signed by John Olsen, they are made using pigmented inks on 100% rag cotton fiber mould made water colour paper that comes in either 256 or 300gsm stock which is pH neutral, acid and lignin free. This bright white paper contains calcium carbonate as a buffer for atmospheric acids. Etching House specializes in the trading of Australian limited edition fine art original etchings hand signed by John Olsen made on cotton rag museum grade paper.